Small Disks and vSAN. What to Do About it? If you have small hard drives (smaller than 255 gb), and you use them for vSAN capacity drives, you might be affected by KB2080503. When the physical magnetic disks used for vSAN are smaller than 255 GB, virtual machines that run on vSAN datastores might experience disk space issues. 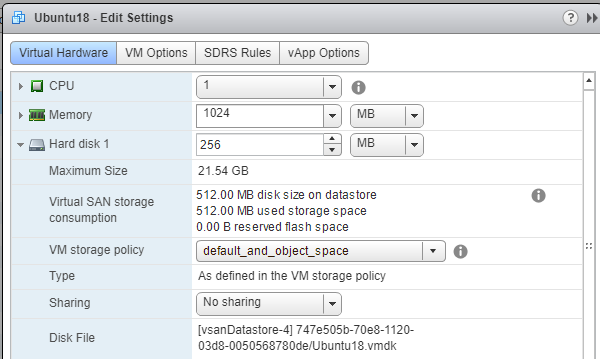 Note: When vSAN stores virtual machine objects, it creates components whose default size does not exceed 255 GB. However, when you use magnetic disks that are smaller than 255 GB, these storage components might end up to be larger than actual underlying magnetic disks. As a result, virtual machines associated with these storage components experience unpredictable behavior and might fail. There is a good explanation of this in Cormac Hogan's blog article VSAN.ClomMaxComponentSizeGB Explained. But that would help only for new VMs created on the vSAN storage. What to do with existing VMs? $defaultPolicy = Get-SpbmStoragePolicy -Name "Virtual SAN Default Storage Policy"
$sp = Get-SpbmStoragePolicy -Name "default_and_object_space"